Two faculty members from Waterford Institute of Technology in Waterford, Ireland, visited Middle Georgia State University (MGA) on Tuesday, February 20, to meet with administrators, faculty, and students. 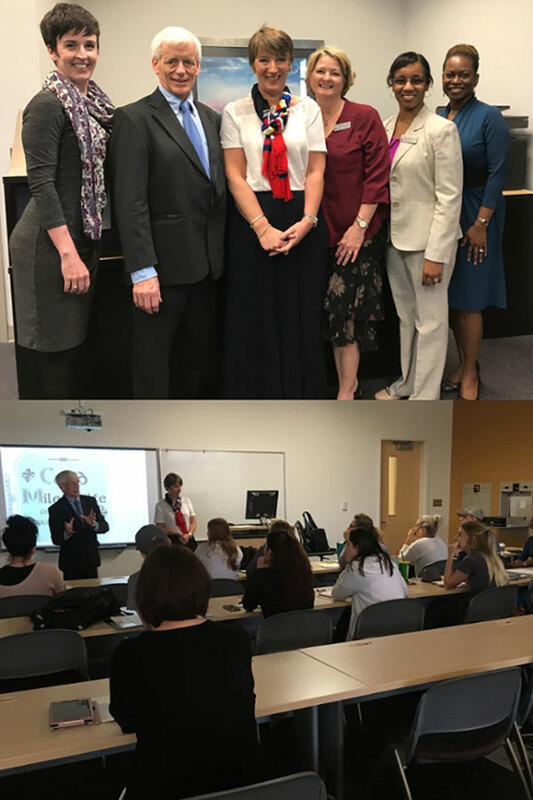 Their visit was to help MGA students in the School of Health Sciences prepare to spend the upcoming Maymester studying abroad at Waterford Institute. Walter O’Leary, coordinator of North American Development, and Dr. Sara Kennedy of Waterford's Department of Nursing, spent the day at MGA and met with Dr. Christopher Blake, Middle Georgia State president; Dr. Laura Thomason, director of International Programs; and several Health Sciences faculty, including Dr. Kendra Russell (director of Program Innovation & Evaluation) and Dr. Kinzie Lee, who will accompany the students to Ireland; Dr. Tara Underwood (dean); Dr. Donna Ingram (Nursing chair); Josephine Kamera; and Shirley Camp. They also met with most of the 20 students who will travel to Ireland May 20–June 1, 2018. Students got to ask questions about their upcoming program, and faculty met with the Waterford representatives to finalize plans for the program’s course offerings. The Maymester in Ireland is a new study abroad program that offers the opportunity for Nursing and other Health Sciences students (including both graduate and undergraduate students) to have an international experience and build intercultural competency while earning course credit toward their degrees. Major-specific, faculty-led study abroad programs such as this one represent an important evolution in MGA’s international experience offerings. Building on the success of the University System of Georgia European Council Ireland study abroad program, also based at Waterford, the new program combines classroom sessions (lectures, group discussions, and research workshops) with study tours to important historical, cultural, and community sites around the southeast of Ireland to give students an immersive experience of Irish culture. For more information see https://www.mga.edu/international/study-abroad/ireland.php.